That’s right you have heard the title many times and we decided to to do something about it. Dave Ramsey has been an inspiration to countless Americans looking to live debt free. He has done more for the economy than the federal reserve could ever imagine doing. Not too mention helping people create their own personal wealth after they used his plans to pay off their debt. This book is a tribute to him and all that he has done, but it is also a great gift to give to those whom you know but are unable to talk about finances. Parents, siblings and friends who think you are crazy for living on beans and rice so that in the future, you can eat whatever you want. 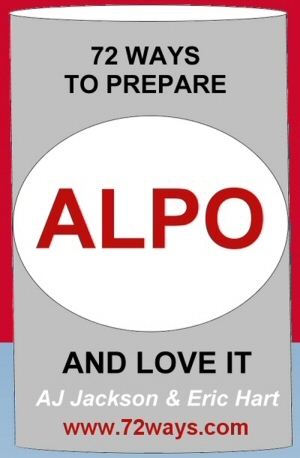 Help them prepare for theirs by giving this book which is filled with parody and sarcasm but also has a list of ways they can help themselves and avoid actually having to use any of our ways to prepare ALPO. The book is currently on Amazons Kindle, but will be added to other e-readers soon. We hope you enjoy reading it as much as we enjoyed writing it. 2 Responses to "72 Ways to Prepare ALPO & Love it"
Thanks for this great book! I just gave it to my brother who always spends more than he makes. I hope it gets him thinking.